The iPad is notorious in not having an accessible file structure. As we know, files are often saved in app, or to the camera roll or to iCloud where you can access the files on another device, as long as you have the corresponding app. The other problem is that the more files you generate, the more you eat into your precious iPad storage. There can also be issues for students where they are searching for a piece of work to hand in to their teacher, and may not remember what app they did it in, or find they can’t send it to the teacher because they don’t have compatible software. Enter Google Drive. Using your Google Account, you can upload up to 15GB of files for free onto your Drive (30GB if you have a Google Apps for Education account). A large majority of apps export to Google Drive, some of which automatically export so you don’t even have to upload manually. 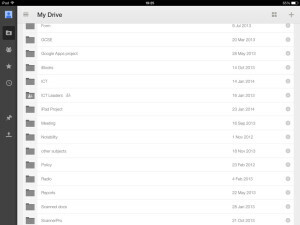 Using Google Drive on the iPad means students can create folder structures for each lesson or year group and file their work away in easy to find places. Factor in the Google search and you can find your work even quicker. In a Google Apps for Education environment, students can even share their folders with their teachers to make a dropbox where the teacher can dip into the student’s work at any time. The other useful aspect of Google Drive is that if you don’t have your iPad with you, you can log in via a browser and access your files quite happily. You can do this to an extent with iCloud and iWork’s new online interface, but this only works for iWork files and not things created in other apps. To be fair, Apple haven’t intended this to be the case. The only slight let down for Google Drive currently is the in-app editing features for Google created documents are still not very powerful, only allowing you to enter and format text. Tables aren’t even supported yet. However, you can just use Pages to do the heavy lifting, and upload it directly from there into your Google Drive. Why not Box, OneDrive (formally SkyDrive) or Dropbox? All of these are good services, but currently Google does give you a few more features which might be useful to a student, such as calendar integration on the iPad, a very solid Gmail iPad app, Google+, and document editing, collaboration and sharing on the iPad and also in browser. Explain Everything is an app which allows you to import pretty much anything into it and annotate and record your voice as if you are giving a presentation. You can record all of this and send it to the teacher. 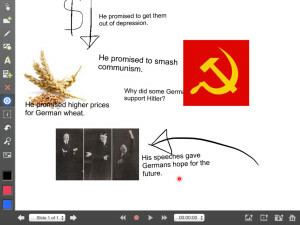 If you are the sort of student who finds it difficult to express themselves properly through writing, Explain Everything offers a very creative solution to record your thoughts verbally, and visually whilst annotating live on screen. You could, for example, have a historical source, maybe a picture, which you can draw on and talk about the different areas of interest in it. This can then be packaged by Explain Everything as a video file and emailed to your teacher. There other other apps which are similar like Educreations and ScreenChomp, but the strength of Explain Everything is that is allows you to import anything into it, and allows you to export anywhere, including a specific folder in your Google Drive. Here is a link to Explain Everything in the App Store. The need to word process is still alive and well in High School. Currently, there really is no competition to Apple’s word processor, Pages. Where Pages succeeds is that it gets rid of all the clutter which non-power users don’t need, giving you decent screen real estate whilst making the features easily accessible. Things that could potentially be a nightmare on a touchscreen device like adding pictures and tables are ridiculously simple to do in Pages. Export options are easy to use too, allowing you to export documents as a Word file, as well as native Pages, PDF or even ePub if you fancy trying your hand at writing ebooks. 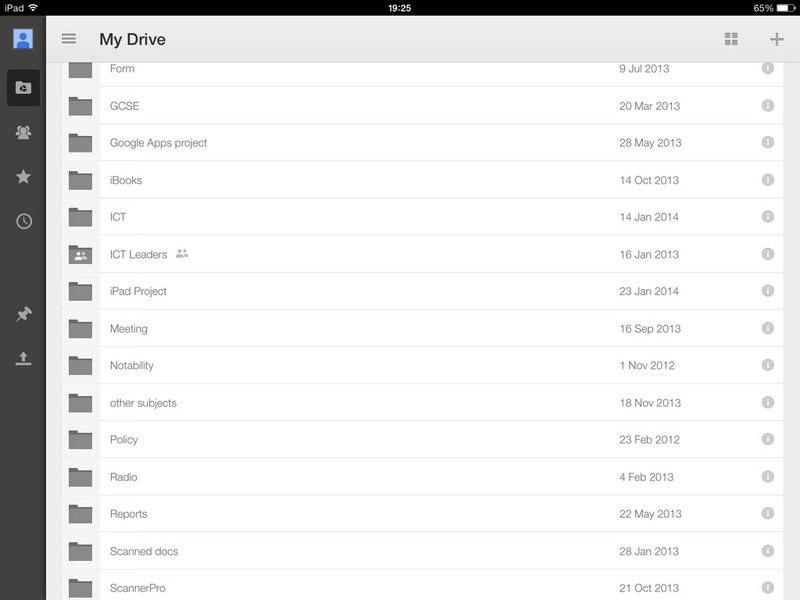 You can also export to a variety of places, including Google Drive. In a place like a school, where students are moving from one lesson to another and things can get hectic, Pages is an app that “just works” for the purpose that it is intended for. Here is a link to Pages in the App Store. The vast majority of schools in the world are still paper based environments, although this is slowly changing. However, it is likely that any information you receive from your teacher is paper based. 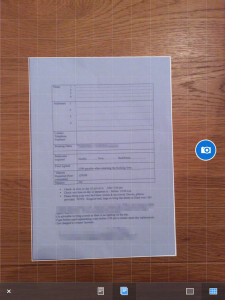 Scanner Pro is a fantastic app which will turn your paper based documents into electronic documents very quickly indeed. 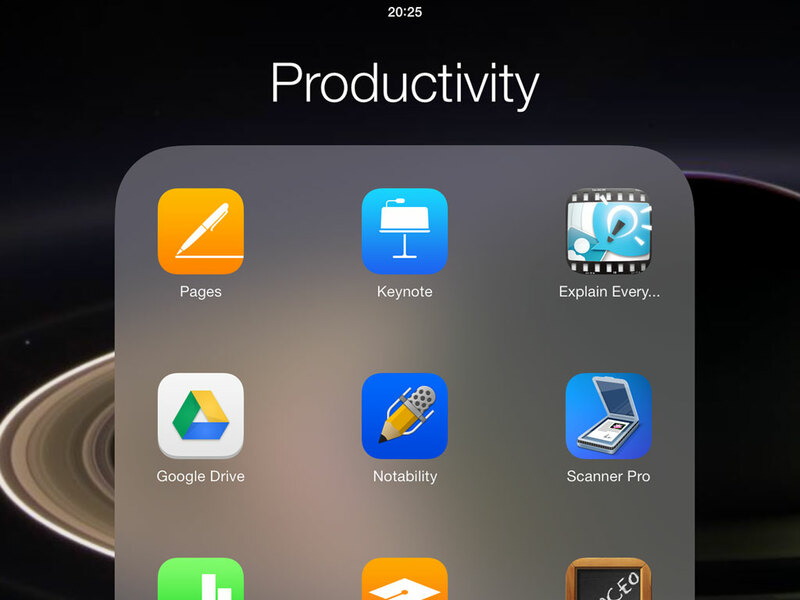 There are, of course, a multitude of scanner apps available in the App Store, so what sets Scanner Pro apart? Firstly, it is rapid. Edge detection of the document is pretty flawless, assuming you are on a contrasting surface colour to that of the the thing you are scanning. The scan itself is of excellent quality, assuming the lighting conditions are reasonable. Scanner Pro will also upload automatically to your Google Drive account AND file itself in the Scanner Pro folder that it creates. This means your ‘paper work’ will be with you even if you don’t have your iPad. I have timed myself and I have been able to scan a document from iPad sleep mode to uploading to Google Drive within 10 seconds. In the school day when time is short, this is outstanding. 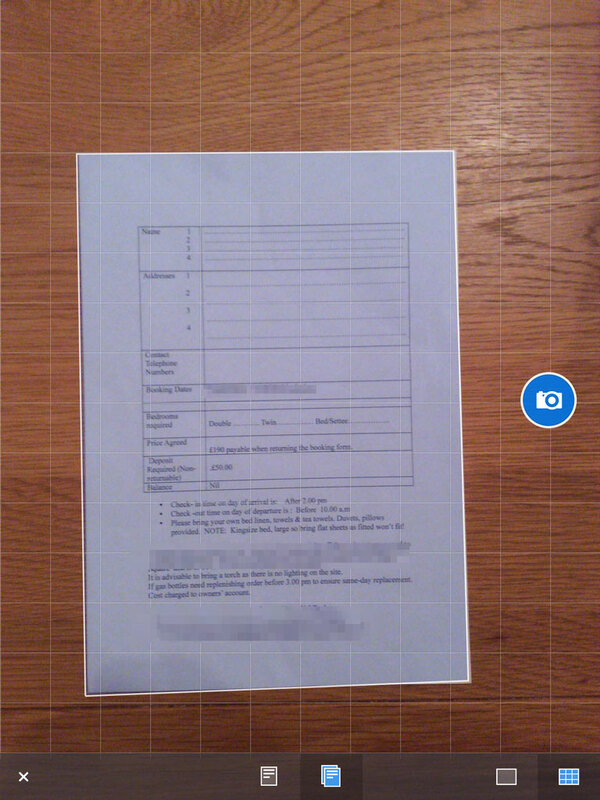 You can also open your scans in a variety of apps, including Explain Everything, Pages and Notability. 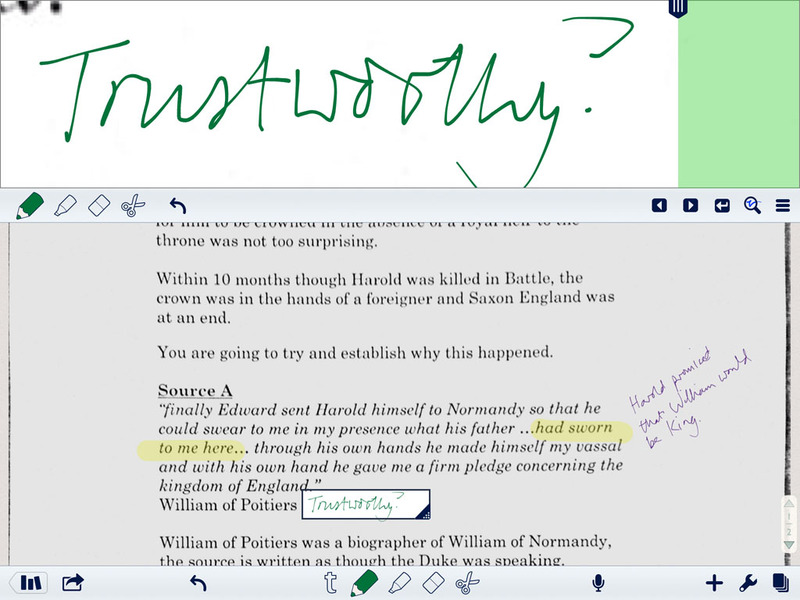 Notability really is the Swiss Army knife of note taking. 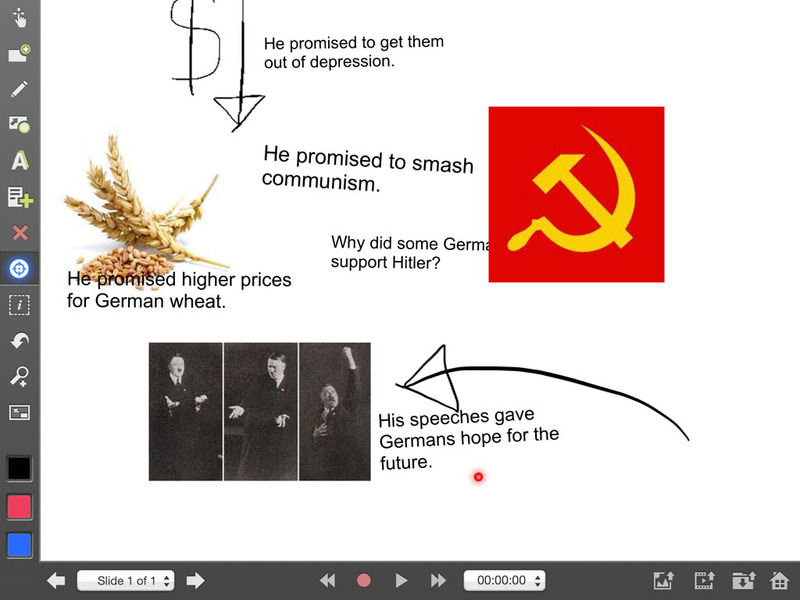 It covers all bases except video notes (which you could do on Explain Everything). Again, there are many apps available in the App Store for note taking, so why Notability in a school environment? Notability will open pretty much any file type (the only one I have found it seems to struggle with is Keynote, but you can turn this into a PDF and open it in Notability like that). Once your file is open you then have a huge variety of ways in which you can write your notes. 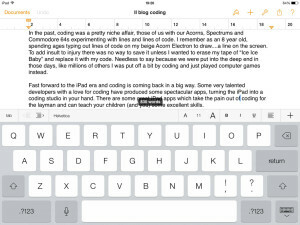 You can write freehand, type in lines as per a word processor, use text boxes, you can even record audio into your notes. 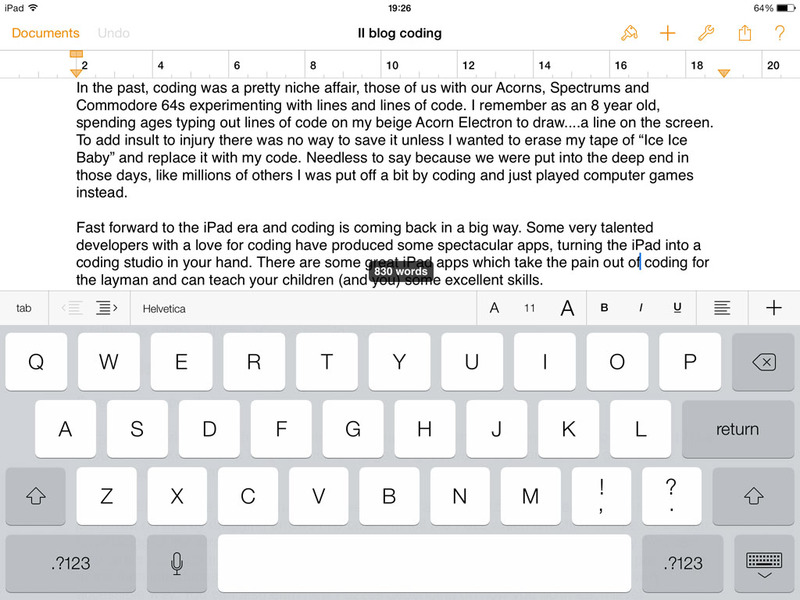 The writing engine in Notability is excellent too. It has a left handed mode (for us lefties) and a very good zoom feature which allows you to write at an acceptable size in the document you are making notes on. 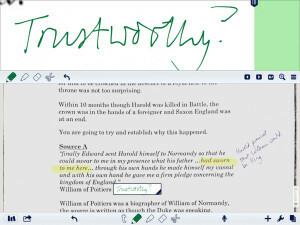 Being left-handed, stylus writing can present a challenge on the iPad, but Notability makes it pretty easy to write quickly and accurately, with a handy undo button for mistakes. It does have a screen guard, but these never seem to sit well if you have Multitasking Gestures switched on. Notability also uploads automatically to Google Drive (as well as other cloud providers), so you don’t have to remember to do this, and again, if you forget your iPad, you can still get your work to the teacher by logging into your Google Drive or similar through a browser. Here is a link to Notability in the App Store. The beauty is these apps is that they all work very well in concert together, and they cover pretty much all the angles that you need when doing bread and butter school work as a student. They turn the iPad into an excellent, and in this Hack’s opinion, more flexible option for work on the move than a laptop. Disclosure: I have purchased all of the apps in this roundup with my hard earned money because they help me do my job with great efficiency.